The LOST ARGs: The Third ARG ? First we had the Lost University, then we had Mysteries of the Universe, now it seems that there is a third strand to the campaign to promote Lost into the stratosphere. The jury is still out on the ARG'ness of all of this and we are not 100% sure if this third strand is an official ABC generated thing or not, however the organisation of it seems to be quite complex for something fan generated. So to the plot, from what I can piece together from comments / other websites and reports from Comic Con, as this appears to be where this started. 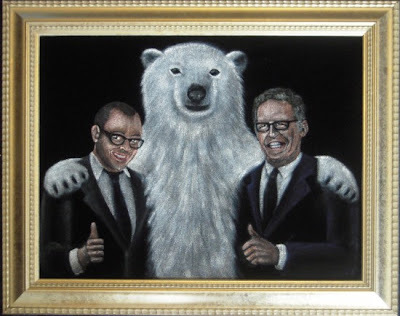 "The first guy was really weird and gave Darlton a black velvet "painting" of them with a polar bear!" From other reports this just seemed like a fan being a fan and doing something fun, however this has now seemingly turned into something more interesting. The person at Comic-Con was comedian Paul Scheer, and he told everyone to go to the site DamonCarltonAndAPolarBear.com it is a blog style site that has been posted to since July 20th. It has lots of Lost related posts, some about the creation of the painting leading up to and following Comic Con. This then leads us on to a web site for Ronie Midfew Arts which has a static picture telling us that 15 Will be lost The 16th Will be Found. 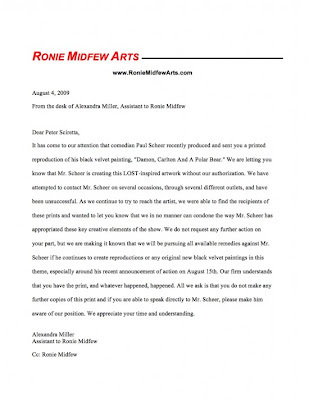 Is it a coincidence that Ronie Midfew Arts is an anagram of Widmore Fine Arts and that a widmorefinearts.com website has appeared ? As always any help in understanding what is happening in the commments will be appreciated. Thanks to Mike in the comments for the first post about this. I hope that this is going to be worth it! widmorefinearts.com was registered yesterday and it's not official. It is not related with the other 2 sites that it seems that they belong to ABC. Anonymous thanks for the information. ABC seem to be going for it in a big way with Lost before the start of the final season. I think, eventually, that this will lead to some ideas about how things may have changed since the bomb...ya think? Interesting theory Ellen, although I'm not 100% sure I can see the path at the moment ! Do you think that the three streams of promotion could be related ? Wouldn't Daniel Faraday be considered one of the missing scientists if things were the same as before? I don't see him among the missing...so, I presume that things may have indeed changed. I don't know, what do you guys think? I do. Simply because Daniel left the Island and went to Ann Arbor and I know that they really can't use the University of Michigan as the backdrop for a promotional tool, so they made it "Lost U"...maybe. I'm almost sure that we'll either see or hear more about the DeGroots and the "goings on" at the beginning of the Dharma Initiative. Even though Daniel managed to get killed, perhaps the bomb really did do what he intended and he is alive. Ah yes I can see the Mysteries showing us some altered timeline information. Would Daniel show up as missing ? That is a question that we haven't had answered on the show - how did Daniel get taken back to the island. Was he given DI status before he left, or did he get re-recruited after he left ? The piture on Paul's DC&APB site looks like he's been in the shredder. We're also suppose to get a video once it's finished downloading to his computer. It would be cool if this really is an ARG. Is Paul the new Rachel Blake ? LOL Yes how could you forget those CAPS Zort. I don't know if he is, but I like that idea. Great post Zortster! And yes, we can never forget RACHEL FONT! Heheh. I really like where you're going with the Daniel thougts, Ellen. I also hope that we find out how Dan managed to get off the isalnd and insert himself into the Ann Arbor scene. With his credentials (and time traveling experience to boot) I can imagine that once he was able to get the ear of someone in charge, they'd eventually listen. Much like his efforts with Chang. I was thinking about the next season and how the story telling might evolve, instead of flash backs / forwards will we see flash sideways. By that I mean episodes where we see different timeline possibilities, one where the bomb went off and one where it didn't. At Comic Con, when that "fan" came on with the painting, we all thought it was a waste of valuable Comic Con time! Little did we know! Yeah, I didn't know who the "crazy" fan was, that is Paul Scheer, but I had a feeling that it was a scripted and planned out thing. According to the peeps at DarkUFO/SpoilerTV both DC&APB and Ronniemidfewarts.com both ping back to the same IP address, and I think it's an ABC address. If that is true then this probably is for sure an ARG, why else then would they have the same address. Plus if Paul S. was just doing this to promote himself, again why would he have the same IP address as RMA and why would it be an ABC address? So I'm still proceeding with caution, but this is starting to "smell" like an ARG to me. I hope it is, and if so, it is starting to have the characteristics of TLE as opposed to Find815 and DWY. So keep our fingers crossed! Looks like DocArzt has had the same letter from Paul and MidFew. Hi guys! I don't want to get my hopes up too much yet but I'm excited! Whether its an ARG or not, that guy with the velvet painting was Crazy!! I thought it was awesome and weird, so maybe this will go somewhere. Keep in touch! Paul updated his blog again, thanking everyone for their support. 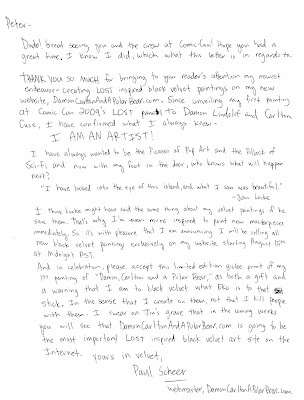 He also posted a letter DocArtz wrote to RMA stating that the fans back up Paul and his fan art. Paul Scheer has made a post thanking everyone for their support. Specificly thanking docArtz. I knew I should have refreshed before I posted. Sorry scoutpost. The polarbear site the word and is a link but seems to redirect you back to the same page any thoughts? Looks like we won't get a video before Monday. Woot!! This really does seem to be a new ARG!! Sayid'sgirl, you're right. Looks like we have to wait 'til Monday for anything new from Paul Sheer. You're link didn't work for me, so I'll add it here again. That would be great, maven.. LOL! Oops Thanks Black Swan for re linking. There's a new post on damoncarltonandapolarbear. It's about a poll concerning whose beards on LOST are Beardo or Wierdo. But Anonymouse on SpoilerTV forum said that if you hover your mouse over each pick numbers come up. Might be some kind of puzzle or code. Hi Maven and Scoutpost! good work! I went to the velvet polar bear site and made some notes here. Interestingly, when I added the "across" and "down" columns, they both equal 178. I don't do sudoku puzzles, so I don't know if this means anything? Maybe all it does is prove that it is a sudoku and I have no idea if the number 178 means anything.. lol! I'm sure I'm reading too much into this.. (I'm good at that) LOL! I'm not sure it's sudoku (which probably means it is haha). I think it's some kind of code, but just don't know what kind. Do the numbers represent letters? Why is Hurley 12-1? Is it one of those where you take a book and copy the 21st letter on the 11th line of whatever page, kind of thing? Like we did with Bad Twin back in TLE? I also think it's code because Michael is 03...not just 3, like the zero has to be there.... eh well, where is Dennis our Slovaltine hero? It's gonna drive me crazy because they gave this on the weekend, when no one's checking and now it's late, so no one's online except the west coasters. It looks like something Dennis would've given us for slovaltine, but I have tried to do different things and just don't come up with an answer. Trying to think outside the box LOL! BTW, if you add the numbers in 178 (1+7+8) you get 16! And that is what it says at Ronie Midfew Arts. LOL, THE 16th WILL BE FOUND!! I like that, BS, 1+7+8=16. But what are we supposed to do with that? We already know something might happen on the 16th. I also have that link bookmarked. Thanks, BS! just noticed on DCAAPB- below the pictures where it's asking beardo vs. weirdo that Weirdo is boldfaced. Think that means something or is is just a typo? You'd think the horizontal sums and vertical sums both equally 178 wouldn't be coincidence, but yeah...what does it mean...? Ok seriously, I need to step away from the computer! I have no idea yet, but maybe the number 178 will become like a password or something? I don't know! I'm using my numbers and turning them from ASCII to HEX right now. I'll let you know if I come up with something.. Sorry, I've got nothing so far.. and I'm on the East Coast, so it's too late now and I can't think anymore.. lol! I hope someone less tired and smarter than me comes up with something. I'll check back here tomorrow! Good-night! 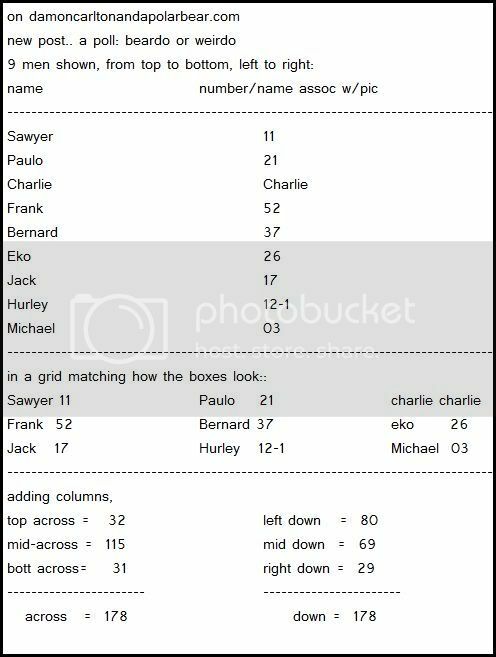 I have been really curious about this new possible ARG, so I've been reading up on all of the different blogs that are related to all things LOST. I think I may have found something, but I am not sure how relevant it may be. If you scroll down to about the middle of the page, there is a picture of a "Pledge" that says, "The Weird Beard is my leader. I will have no leader before him." I don't know if this is all just coincidence or if it really means something. Der Merzmensch has taken screen shots from the Mysteries videos and found some interesting things. Black Swan I hope you don't mind but I've used your excellent analysis picture on a new post on the blog. Roxanna, yes we and Der Merzmensch found this link together, it is almost too much of a coincidence not to be significant. hello..I too am a recipient of a print of DC&PB. After having some fun on Paul 's DC&PB website,,it was arranged by his assistance to be sent to me in Thanks for helping his website a success. Soon after receiving the print, I too received a letter from RonieMidfew Arts..telling me what I can't do with the print. I am not sure if I am a piece of this game,,but part of me wants to take the offense and go against this RMA outfit. Okay..I have a great distaste for the Widmore character. I have no idea where this is all leading to, but something tells me to help shape it. I am interested to know if any other " civilians" have found themselves recruited into a ARG, without realizing it at first. This is all very surreal for me, but if any know of me from abc.com..LOST and surrealism have been one and the same for me since the beginning.